Despite the weight, the Twin is exceptionally well-balanced and the weight disappears once the bike is moving. 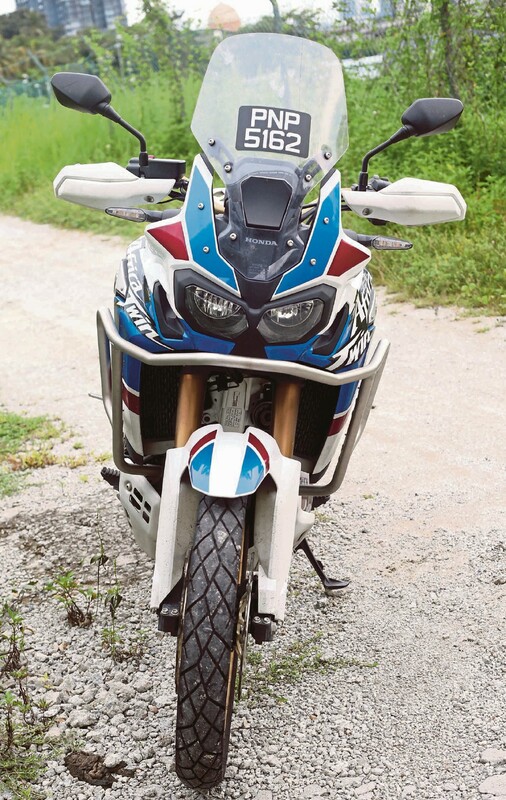 THE original Honda XRV650 Africa Twin, introduced 30 years ago, shares nothing with the new CRF1000L, bar the iconic name and dual front headlights (albeit LED). The spirit of the original still persists, a combination of usable power and capable handling, making the new Africa Twin worthy of the name. The one tested here is the DCT Adventure Sports version, an all-singing, all-dancing version of the latest of the breed. The most obvious difference between the normal version and the Adventure Sports version is the added height. But there are plenty of other detail differences. The seat is flatter and gives a more upright riding position. Incidentally, the seat height adjusts from 900mm to 920mm (50mm higher than the standard model). The fairing is larger and the windscreen, 80mm taller. The fuel tank is 5.4 litres larger (up to 24.2 litres), making the Adventure Sports able to traverse 500km between fill-ups. A charging socket and heated grips are standard. The engine remains the same. A four-valve 998cc parallel twin, the Unicam boasts a peak power of 70Kw @ 7,500rpm, with 99Nm torque @ 6,000rpm. The 270∞ phased crankshaft and uneven firing interval create a distinctive throb quite like a V-Twin. Four-valve cylinder heads are fed by PGM-FI fuel injection, with twin spark plugs and dual and sequential ignition control. The semi-dry sump engine reduces overall engine height, allowing a 270mm ground clearance. THE new CRF1000L shares nothing with the original Honda XRV650 Africa Twin, introduced 30 years ago, bar the iconic name and dual front headlights (now LED). The big news is the new throttle by wire engine management. This allows three riding modes to adjust engine character and output to suit riding conditions. The Honda Selectable Torque Control (HSTC) is now adjustable seven ways, up from three of the previous Africa Twin, from Level 1 for aggressive off-road riding to Level 7 for slippery, wet tarmac. It can also be turned off completely. The three riding modes are Tour (max power, medium engine braking and high HSTC), Urban (medium power, medium engine braking and high HSTC) and Gravel (low power, low engine braking and high HSTC). There is also a User mode where you can customize the levels of intervention. 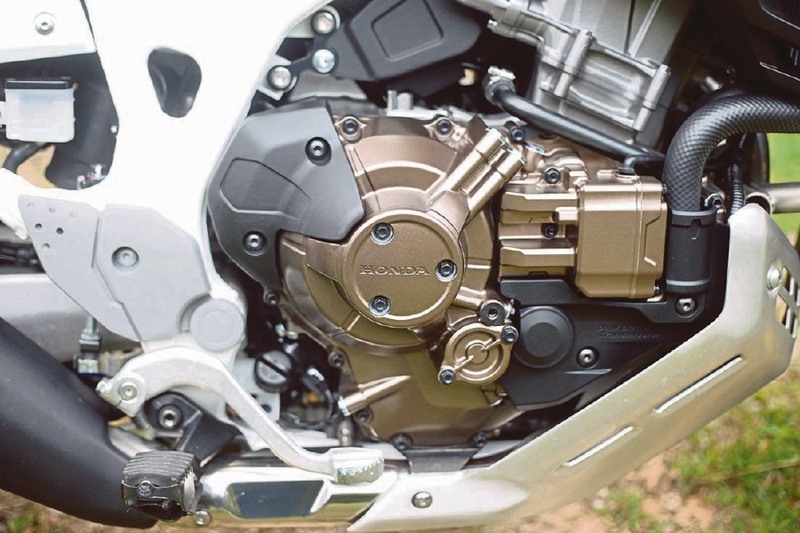 For those who are new to Honda’s DCT (Dual Clutch Transmission), here is a quick primer. DCT has two clutches: one first, third and fifth gears: the other for second, fourth and sixth. Each clutch is independently controlled by its own electro-hydraulic circuit. When a gear is selected, the system pre-selects the target gear using the clutch not currently in use. The first clutch is then electronically disengaged as, simultaneously, the second clutch engages. The result is a consistent, fast and seamless gear change. A four-valve 998cc parallel twin, the Unicam boasts a peak power of 70Kw @ 7,500rpm, with 99Nm torque @ 6,000rpm. DCT has three modes; MT mode is full manual control, allowing the rider to shift with the handlebar toggle control levers on the left switchgear. Automatic D mode is ideal for city and highway riding, and achieves optimum fuel efficiency. Automatic S mode offers three levels of sportier riding, as the engine revs a little higher before shifting up, and shifts down sooner when decelerating for extra engine braking. Auto mode can be overridden at will by using the toggles but the ‘Twin reverts back to Auto mode depending on throttle angle, vehicle speed and gear position. DCT is still usable in off-road situations with an additional mode; G (Gravel) mode. Pushing the G switch (separately located in the instrument panel) in any riding mode improves traction and control by reducing the amount of clutch slip during gear changes. Needless to say, the engine and DCT gearbox work seamlessly with each other with intuitive gear selection and smooth gear changes. The additional height of the Adventure Sports is down to the new fully adjustable 45mm Showa inverted forks with 252mm travel (up 22mm from the normal ‘Twin) and the fully-adjustable Showa rear shock with 220 mm travel (up 20mm). Dual radial-mount Nissin four-piston brake calipers and 310mm ‘wave’ style floating discs do stopping duties. Lightweight two-channel ABS can be turned off for the rear caliper only. The 21-inch front and 18-inch rear spoked wheels are de riguer off-road equipment. Wet weight is 253kg. 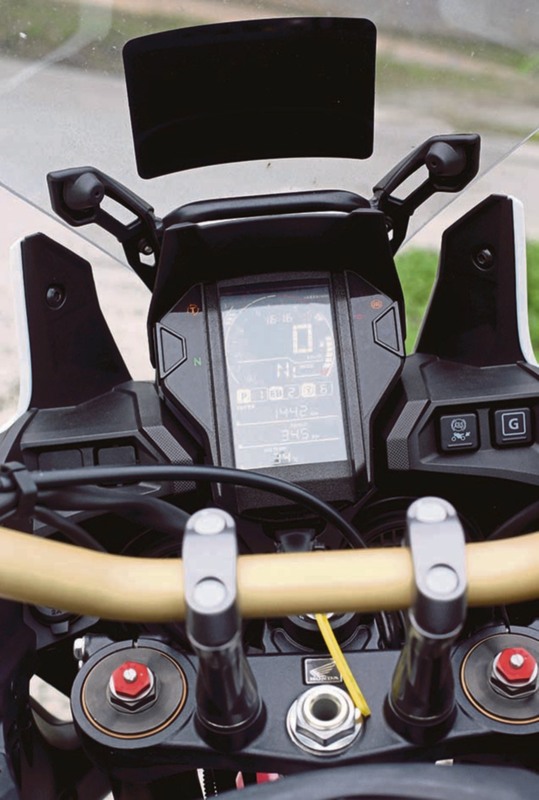 The instrument panel on the CRF1000L. Despite the weight, the ‘Twin is exceptionally well-balanced and the avoirdupois disappears once the bike is moving. Handling and suspension control is also superb on road and although our off-road excursions were limited, the lightweight feeling doesn’t decrease. The Adventure Sports’ riding position is more natural for off-roading, especially for standing up. The bigger fuel tank does intrude but not unduly. There are plenty of accessories even for the full-fat Adventure Sports. There are touring bags, rubber pillion footpegs, DCT foot shifter, fog lamps, wheel stripes, an alarm system, centre stand, sump guard, not one but two types of lower seat and a tankbag. 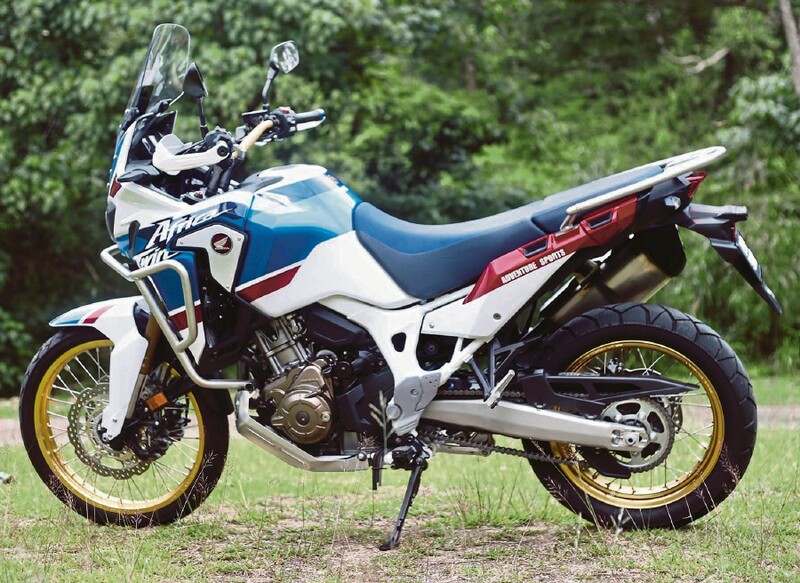 The 2018 CRF1000L Africa Twin Adventure Sports will only be available in one 30th anniversary Tricolore paint scheme, all the better to celebrate the original’s launch in 1988. See you at the Dakar startline soon.